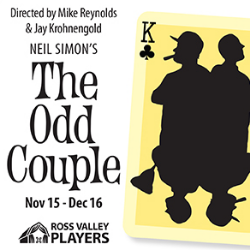 The Odd Couple presented by Ross Valley Players - Neil Simons funniest play. The original 1965 production received 4 Tony Awards, including Best Playwright. NY Times review "There is scarcely a moment that is not hilarious." Directors Mike Reynolds and Jay Krohnengold will take you back to that original, delightful concept. Join Oscar, Felix, and friends for a couple of hours of pure fun.